Places to fish along the river. Note: I wanted to bring back this post from 2012. 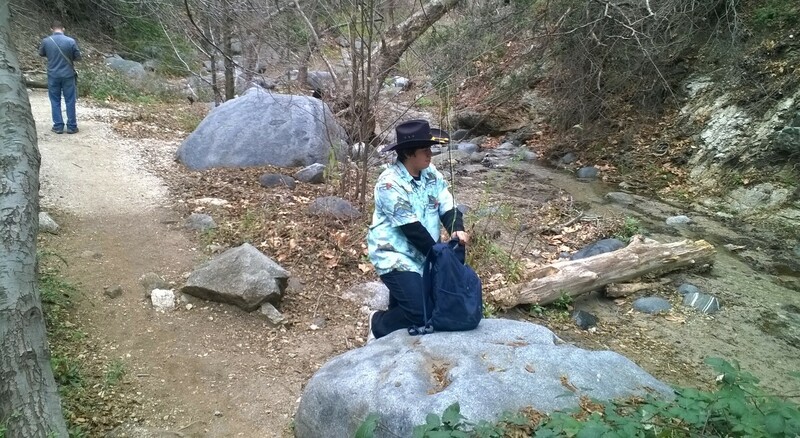 With all the rain we’re getting, maybe fly fishing will return to what it was in the San Gabriel Mountains before the drought and the Station Fire. Winter’s always a good time to dream about the next cast. 1. Play hooky any Monday, Tuesday, Wednesday or Thursday. Skip Friday and forgettabout the weekend. There are always several thousand people who have the same idea at the same time. Crowds = lousy fishing. 2. Dress warmly in layers. Long underwear is a blessing this time of year. 3. Take it easy on the way down. Watch for gravel, sand and rocks that might give way. They will. Count on it. 4. Start with dries and move to nymphs. I know what you’re thinking: no hatch = no surface action. You might be surprised. 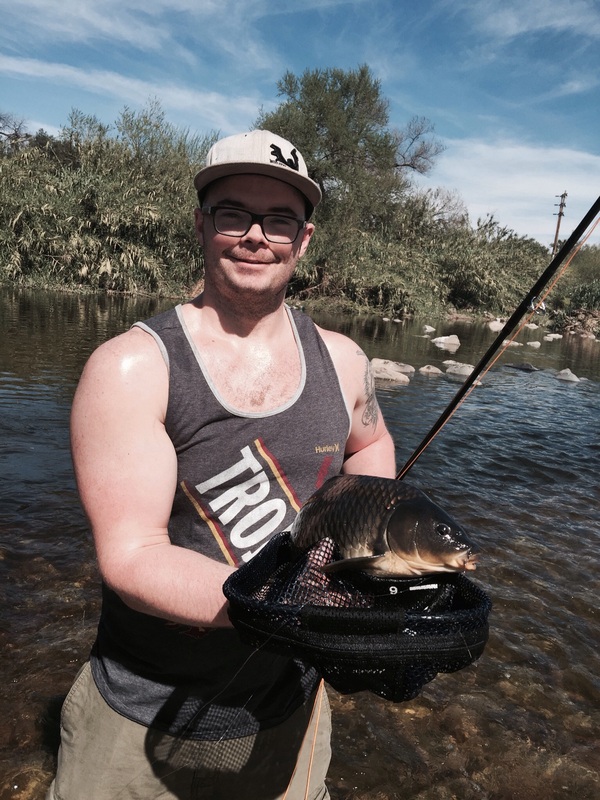 Of the 10 fish I caught on my recent canyon adventure, two were on dries. Pick the usual suspects. Parachute Adams and his friends. 5. When you do reach into your fly box for a nymph, give that beadhead yellow sallie a try. I know it’s an underused Stone Fly, but the other eight fish I caught were all on this fly. Must be the legs. 6. Smaller is better. 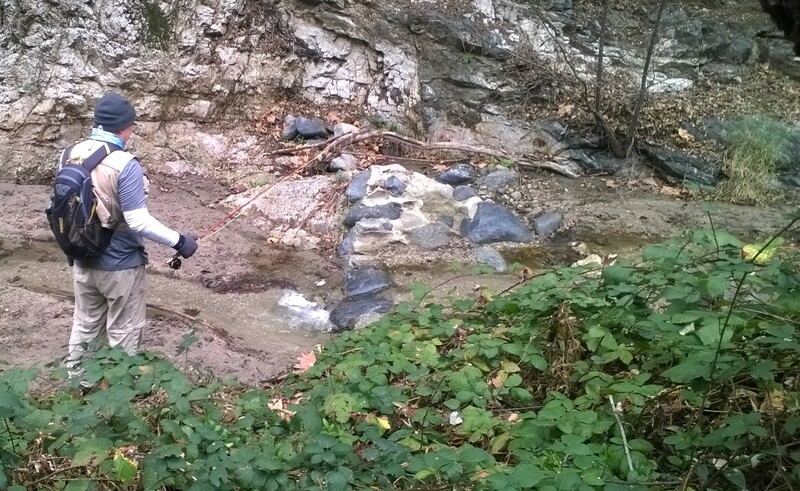 Even with all of our rain, flows are down. Size 14-16 or above, please. 7. Pack a lunch and extra water. 8. Bring a friend, someone who will make you laugh at some of those tiny trout you’re bound to hook. 9. Don’t wear hiking boots on slippery rocks. Just because the water’s cold, any rock in the water is still as slippery as it is in summer. 10. Turn your cellphone off. Keep your camera on. I know, you’re saying that there’s no service up there anyway. True, but it’s the principle. 11. Post your pics, so we can all see how good you look grippin’ ‘n’ grinnin’. 12. Keep an extra water and energy snack in the car. Baker’s dozen: Get down. Get tired. Get silly. Get grateful. Repeat. My friend, Roland Trevino, is an avid fly fisher, and he had been bugging me to try this new spot on the river. I’m a creature of habit, and had, thus, stayed mostly on my stretch of the river till then. Last Sunday morning, he called me and said that he and his son, Ansel, were going fishing for bass at the aforementioned spot. I had not yet caught a bass on the river, so I decided to join him with my daughter, Julia. I had my 2 wt. and she had her spin rod. I put on a fly that I don’t even know the name of. Within three casts, I had a small bass. A couple more casts and I had a green sunfish. Then, the fun really started. A nice-size tilapia struck the fly hard. Several more of varying sizes hit the same fly. Each time, they were hooked perfectly on the lip, so that I had to barely touch the fly to remove it. Meanwhile, my poor daughter had had a few sad tugs. The worms were not working, so I actually put a small beadhead with a split shot and a strike indicator. That had worked before for her to catch sunfish downriver. But no luck! We waded up the river where Jim Burns and his son had been fishing earlier and had caught some tilapias. As we were walking in the shallow, warm water, I shared with my girl the craziness of what we were doing, wading through the Los Angeles river, a place that most Angelenos think is devoid of life. It was far from devoid of life. Flocks of sand pipers scurried along, as if skating on the water. Egrets eyed us suspiciously. Seagulls stood as statues. Black-necked stilts glided nervously from one spot to another. 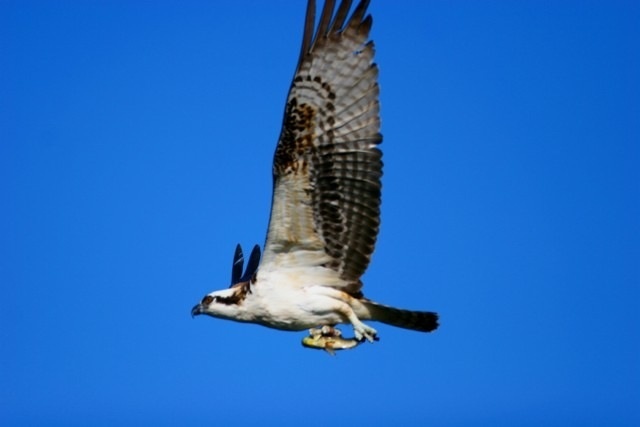 Two ospreys patrolled the channel. We got to the spot, and, indeed, there were significant schools of tilapias. We were not having much luck, but then, we saw something that will be indelibly stamped in our memories. Not more than 20 feet away from us, an osprey smashed into the river and struggled to take flight again. Clutched in its talons, a tilapia was wriggling. I decided to be a good dad and gave up my fly rod. 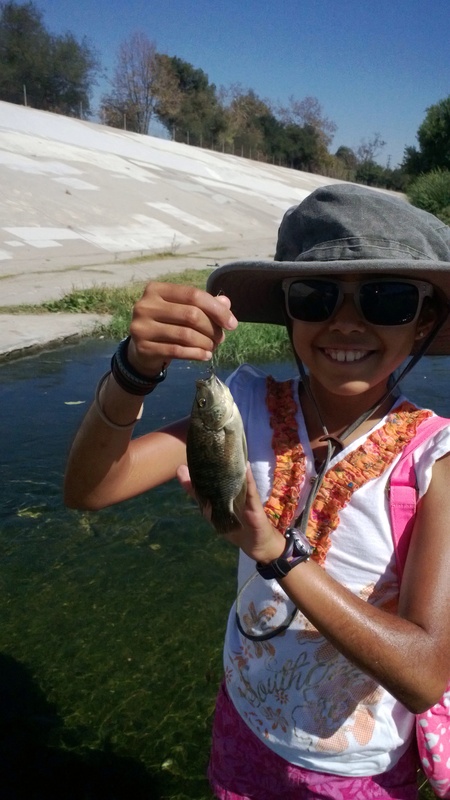 We went back to our first spot, and, after a few casts, Julia was proudly holding her first tilapia. Soon after, I saw Roland and his son wading back from their expedition. Apparently, they had caught a good number of bass. The river never ceases to amaze me. In one day, I had caught a green sunfish, a bass, and many tilapias. More importantly, I had spent an unforgettable day with my daughter. Editor’s note: And Roderick is now the proud owner of a LARFF T-shirt for winning the twofer challenge. Great job!